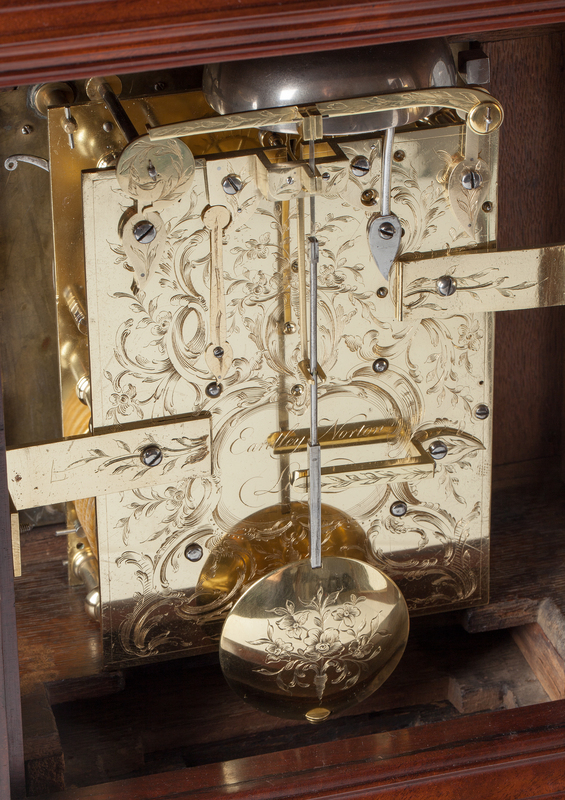 The eight-day, spring-driven double-fusee movement of this bracket clock consists of going and striking trains with trip repeat. The going train has dead-beat escapement and a short pendulum. The striking train indicates the hours fully on a bell. This can be repeated at all times by pulling a chord to the side of the clock. 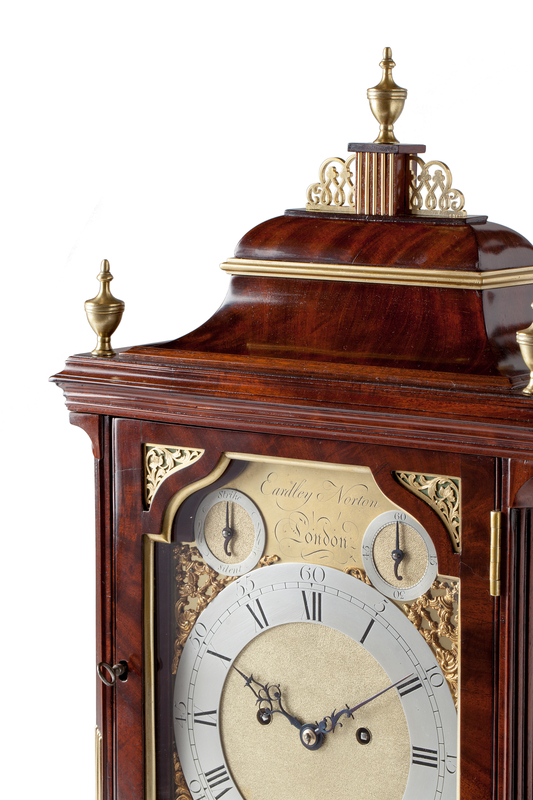 The backplate is profusely engraved with scroll motifs around the engraved signature cartouche: Eardley Norton London. 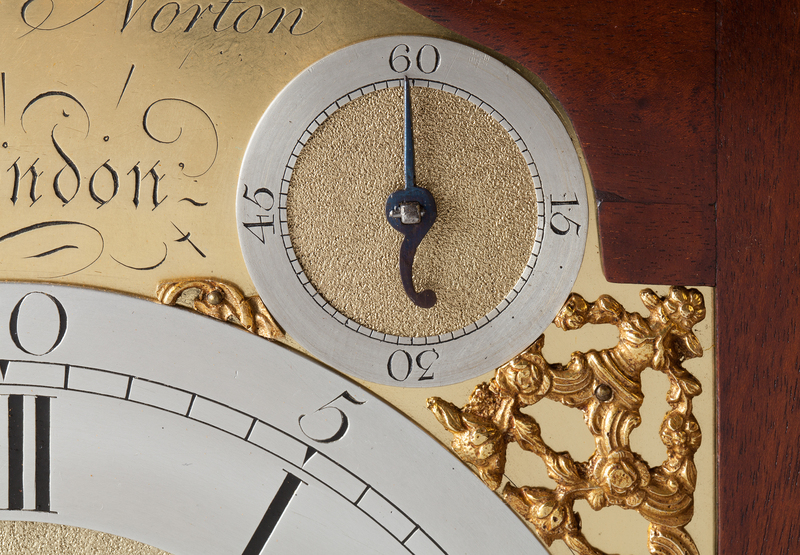 The shouldered arched brass dial has a silvered brass chapter ring with Roman hour numerals, Arabic five-minute and minute divisions. There is a date aperture in the matted centre above the VI. The time is indicated by a pair of fine pierced blued-steel hands. There are two subsidiary dials above the chapter ring, the left one for switching of the striking: strike/silent, the right one for regulating timekeeping, a so-called rise-and-fall dial. 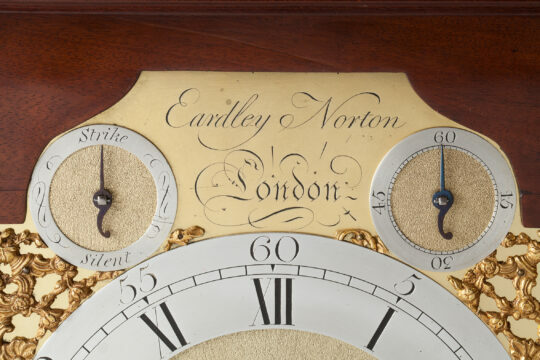 Between these two is the maker’s signature: Eardley Norton London. The four corners are embellished by cast-brass spandrels. 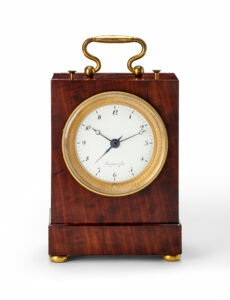 The walnut-veneered oak bell-top case of this bracket clock shows quality in its finishing, notably in the chamfered corners, which are fluted and reeded. 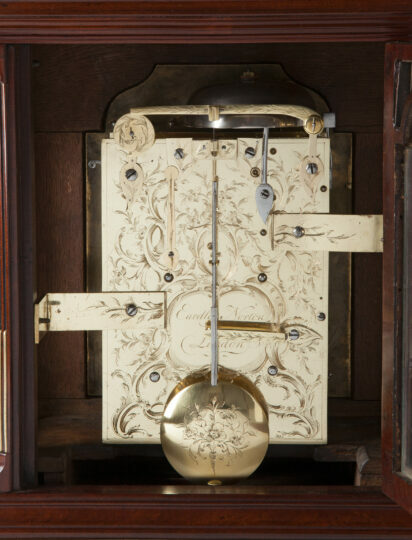 It has windows on all sides with brass-framed glass, so that the movement is entirely visible. The glass in the back door is also arched. There are brass carrying handles of both sides, whilst the front door has pierced sound frets in the top corners. The clock is surmounted by five vase-shaped finials, the top one on a reeded base with delicately pierced supports to the sides. 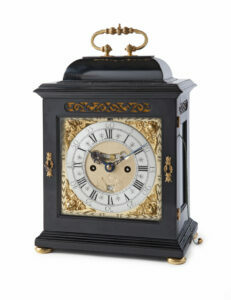 Top and bottom of the case are moulded, whilst the clock rests on four brass bracket feet. 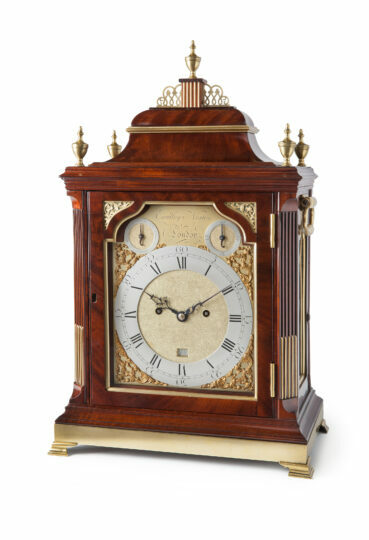 Brian Loomes, Watchmakers & Clockmakers of the World, London, 2006, p. 575. Eardley Norton was born in Lincolnshire in 1728 and was active as a clockmaker in London, in 1762 in St John Street. 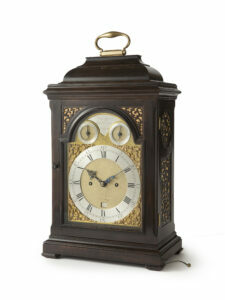 In 1770 he became a member of the Clockmakers’ Company. A year later he obtained a patent for a striking mechanism for clocks and for repeat work in a watch. He died in 1792.